Hulk smash puny Skrull with motion controls! The Avengers film was a long time coming, and fans generally agree that it really delivered. Oddly lacking among the multitudes of comic book and toy tie-ins, though, was a videogame adaptation of the blockbuster superhero throw-down. Would-be heroes need only be patient a little longer, though, as a whole spate of Avengers titles is on the way. At New York Comic Con 2012, I had a chance to try one of them: Avengers: Battle for Earth, a Kinect-based fighting game based on the popular Secret Invasion storyline. 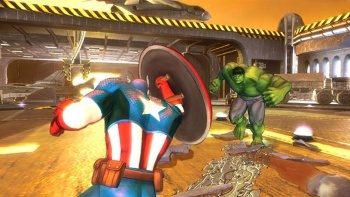 This game, which marks the first collaboration between Ubisoft and Marvel, has all the bells and whistles a fighting game needs: a large roster of recognizable characters, a variety of single- and multiplayer modes, and plenty of ways for the cast to blast and bludgeon each other into submission. Those who remember the events of Secret Invasion will be familiar with the setup already: A new breed of shape-shifting Skrull have infiltrated the ranks of superheroes in the Marvel universe. Led by Queen Veranke, these aliens will displace all of the heroes and conquer Earth - unless, of course, the remaining real heroes can find a way to stop their doppelgangers. In terms of Battle for Earth, this essentially gives the game an excuse for the good guys to fight each other in addition to the villains. Battles are tag team affairs, so building a team to match your playstyle is vital. For the demo, I led a team of The Incredible Hulk and The Mighty Thor against mainstay ne'er-do-wells Loki and Venom. Rather than controlling every move my characters made, all actions were contextual. Each battle takes place from an over-the-shoulder perspective, so while I stared down my enemy, I had a few long-range attacks at my disposal. As the Hulk, I could clap my hands together above my head to generate a shockwave, get in close with a kick, or move from side to side to dodge. Actions have different levels of effectiveness depending on their timing and the opponent's response. For example, a well-placed punch can interrupt an attack that requires charging, or two kicks launched simultaneously can push each party back a few steps. While the motion controls definitely take some getting used to, the Kinect had no trouble interpreting my movements once I got used to performing them. Punching and kicking are both intuitive, and as a martial artist, I was pleased to discover that the speed of my attacks counted for something. A series of fast, crisp punches will dish out more damage during a special attack than a few halfhearted ones, and keeping a leg aloft for multiple kicks allows a player to throw them out in very rapid succession. I had a few problems pulling off some of the more complicated maneuvers, such as a two-handed clobber that required something akin to a golf swing, but that has more to do with learning the moves than the Kinect registering them. Avengers: Battle for Earth has a lot of interesting mechanics at play, although its success hinges upon how successfully it can connect all of them. The central battle system works, but each character will need to feel very different in order to facilitate a varied campaign and a lively online user base. Additionally, even one round can leave a player a little short of breath, so it's hard to imagine playing it for hours at a time. Still, if you've ever wanted to step into the shoes of your favorite Marvel character, this is about as close as you're going to get for now. The game ships on October 30, 2012.